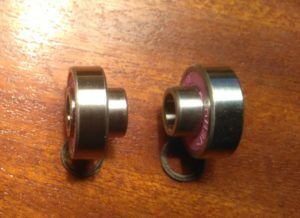 Skateboard & Longboard bearings, which are the fastest? If you are looking to go as fast as possible and be the first one down the hill, getting the right bearings is critical. The right bearings will allow you to take your skating to the next level without holding you back. They can definitely make difference to how your setup performs, so it is important which you pick and how you set them up. Given there are a lot of bearing option out there, it can be understandably confusing to pick a good set for yourself. With that in mind, today’s article is a simple guide that will explain what goes into high-quality bearings and how to pick one according to your needs. Industrial bearings actually do have high precision and small tolerances, are they better for skating? So then, what makes up the best skateboard bearings? Built-in bearings or traditional ones? If you find yourself at the skatepark or in a conversation with a longboarder, any conversation about bearings will quickly turn into an argument about which are the fastest. But here is the kicker, bearings are all kinda the same when it comes to speed and it makes no difference which one you use – given they are of decent quality and are well maintained. This is especially true when it comes to simply rolling/spinning. The above said, there is more to a bearing than simply rolling. Their other features generally affect their overall performance and your ultimate experience with them. But how is all this demonstrated practically though? If you take evidence from the results of the L’Ultime Descent – the fastest gravity sports race in the world, you’ll see that the statement “bearings don’t matter” holds true. At this event, stand-up skateboard riders can expect to go as fast as 80mph and luge riders can even get up to 100mph … so yeah it is a pretty good testing ground for the fastest bearings. The winner of the stand-up skateboard event – Pete Connolly from Britain, achieved a top speed of 146.73 kph (or 90+mph). Pete went to the event with a custom made set of bearings. These bearings were a specially designed set, made by Aaron Skippings who works professionally as a bearing manufacturer. The bearings, of course, had the strictest of tolerances and were polished with a special compound as Pete really wanted to win and was not going to leave anything to chance. They definitely set him back a couple of £££s. Enter Max Capps. Max, used a fresh set of Ceramic Zealous bearings and achieved a top speed of 145.94 kph. This is incredible as you can walk down to your store and buy a set of Zealous for less than $30. These bearings performed almost as well as the custom industrial grade bearings Pete had. That said, the ceramic Zealous probably wouldn’t hold up as well in an industrial setting. Of course, other factors such as wind, temperature, wheel choice and the riders ability probably played up. So it’s hard to say if the bearings alone were responsible for the speeds. That said, a difference of 0.74kph isn’t that much, especially for you as a user who will probably not be attempting any world record speeds soon. In summary, if you have decent quality bearings, they should perform more than adequately for you and for your use for them when it comes to skateboarding and simply rolling. But, if industrial bearings are so precise, why don’t they make a difference for skating? The place where minute differences between bearings make a difference is in an industrial setting. Bearings for industrial use are designed and manufactured with small tolerances and are highly precise. They will experience high temperatures, thousands of rotations per minute and high stresses. Loads of factors go into these bearings and they are designed so they can perform their best in high precision settings. If used for skating, these industrial bearings will simply be ‘overkill’ – for lack of a better word. A skateboard wheel doesn’t rotate as fast or provide any stresses similar to what the bearing will experience industrially. It simply will not allow for the high tolerance and precision manufacturing of this bearing to shine through. Those tiny differences wouldn’t be able to reflect in the performance of these bearings at all, the margins will be too low. The same can be said for ceramic bearings. Whilst they don’t need lubricant and aren’t affected by heat as much, they are overkill for skating. The bearings we use are also not fully ceramic. Completely ceramic bearings are too brittle for skating and could burst if you land too hard from an ollie, or hit a curb with your wheel. Ceramic skate bearings use ceramic balls with steel racers and nylon retainers. So they are still prone to rust and still need to be maintained. The bearings will also not have enough rpm to allow for the properties of the ceramic to shine. Finally, because of the small tolerances, high precision, and strict manufacturing process, industrial bearings are also ridiculously expensive. This is and will be quite impractical for your wallet, especially if you replace your bearings every few months. The ABEC rating is generally used to describe how tight and small the tolerance of a given bearing is. With skate bearings, you will encounter ‘ratings’ between Abec 1 to 9. Companies use these ratings to describe how ‘fast’ a given bearing will roll, with Abec 9 bearings generally being the fastest and Abec 1 the slowest. This is mostly false and is just hype to help sell their products. ABEC ratings do make a difference, but not in our application. Even then, if our bearings were actually measured and manufactured to meet them, they will simply become too impractical and expensive for us to use for skateboarding. In fact, our bearing specialist Aaron Skippings say that anything above Abec 5 is getting into aerospace standards and would actually be super expensive. As well, if you do your research, you find that the majority of bearings sold are in the Abec 1-3 range. 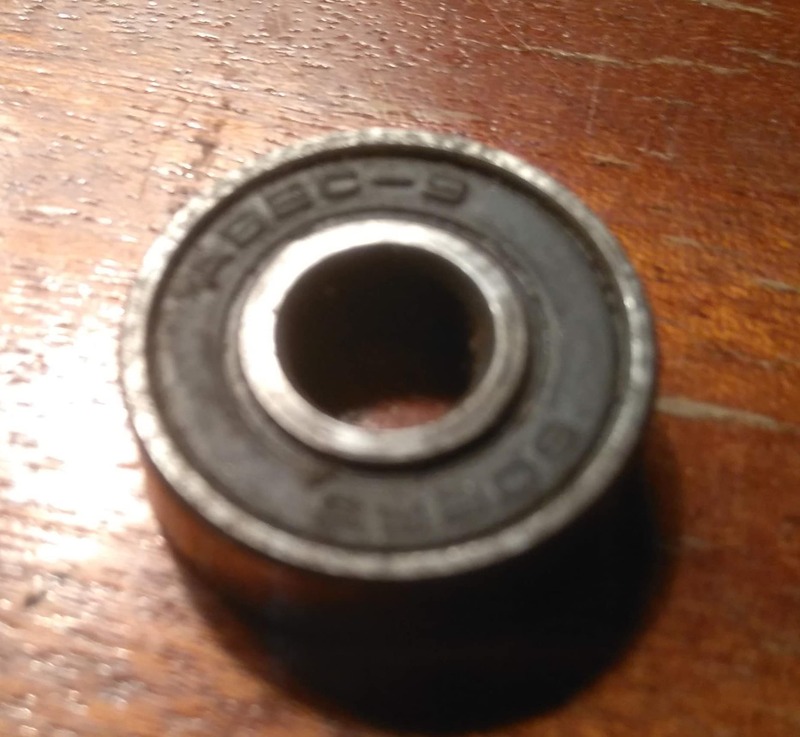 Even if they did matter for us, the ABEC ratings only measure the performance of a few aspects of a bearing (the raceways, smoothness of running surface etc.) which doesn’t tell the whole story of the bearing and if it can stand up to the abuse of skating. A skateboard bearing will experience loads of different forces and will be forced to perform in a variety of environments and situations. All of which the ABEC rating doesn’t account for. So in summary, the ABEC rating used on skate bearings is simply a gimmick. Most companies use them to try hype up their product. Speaking with Aaron Skippings, I found out that maybe one factory manufactured bearings above Abec 5. Anything you see on the market labeled Abec 7, 9 etc. is certainly fake. ABEC ratings do make a difference in an industrial setting, but that’s beyond the limits of skating and it is inappropriate to use it to describe a bearings performance for skateboarding. That said, why is it some bearings roll much longer than others? “My bearings rolled for more than 4minutes, they must be the best.” This is also false. When you are skating on your board, your bearings are experiencing a multitude of loading forces. For example, your weight, the gyroscopic force of the wheel, heat, feedback/vibration from the road, side loading forces from turning etc. The bearing lube you use will also make a difference. Thicker lubricants like lithium grease won’t allow for a lot of freeroll but will ride smooth and roll decently in application. Thinner lubricants like Bones speed cream will generally have great freeroll and might roll faster in practice. That said, as the bearing heats up, the lubricant does too and this will affect its performance. Some lubricants are designed to operate optimally at higher temperatures. This means they will offer less resistance and roll faster at those temperatures. This can’t be simulated by simply spinning the wheel. In summary, if you simply spin your wheel, your bearings will not perform the same as when you are actually riding. Because of that, this test is actually inaccurate and will not demonstrate how your bearings will perform under stress. It simply isn’t a good metric to measure the performance of a bearing. The above said, at low speeds, thinner lubricants may be more desirable. If you look hard enough, you would also find some cheap Chinese bearings available too. So you basically have a lot of options and you need to decide which one is right for you. But what makes one bearing better than another? Why should you pick one over the other? Each of those bearings has different properties or features. These features make them either easier to maintain, easier to use or even more durable in the long run. If you are going to pick one, you need to decide which property is most important to you. If you want your bearing to last long and perform well, you need to be able to maintain it with ease. Maintenance allows you to clean out the gunk collected by the bearing, put in fresh lube and prevent it from rusting and seizing up. It can allow you to skate your bearings for months and months and to then clean it to make it perform like new. With rubber shields, you can take out the shield to effectively clean the bearing. They allow you to expose the balls and even take out the retainer so you can get as much cleaning fluid and wash the bearing properly. They also allow you to input lube directly on the balls so you can precisely input however much you need. Check out the image to the right to see what a bearing with a rubber shield looks like. With metal shields, you simply can’t take them off. When too much gunk, water or rust enter/build up in the bearing, it is basically done for. The metal shields don’t allow you to effectively clean the bearing or take out any gunk collected inside. It becomes hard to increase the longevity of the bearing as cleaning it usually can. Check out some bearings with metal shields to the right. It’s easy to say that the best bearings are the best-maintained ones. Regular maintenance allows the bearings to be free of rust, dust and any gunk that may shorten their working life. It also ensures they are clean and lubed up to provide the best performance possible. Ease of use of a bearing is an important feature. This is especially true when it comes to swapping wheels, maintaining bearings, changing gear etc. It can make maintenance a lot more convenient. Ease of use is generally determined by whether the bearing is built in or not. Built-in bearings basically come with built-in spacers and speed rings. A good example of these are the Zealous built-in bearings. These allow there to be less parts in your wheel; meaning you only need two parts instead of the 5 you would otherwise need to make your bearing perform at its best. That said, if you are more patient these probably won’t be very useful to you. Check out the image of the built-in bearings to the right. Traditional bearings have to be used with a speed ring and a spacer to get the best performance out of them. They can be a pain to use, especially if you are swapping wheels and maintaining your bearings. The parts are also small and they can easily get lost if you aren’t careful. The image below highlights the five parts you need to have a complete bearing setup. It can be especially annoying to have to handle all of these as you swap wheels or maintain your bearings. In my opinion, built-in bearings are always better than traditional single ones. 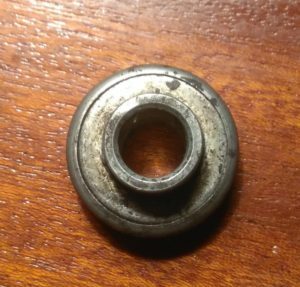 Though you might have to buy a set to replace a bearing if you lose a single one. Some people still prefer traditional bearings though, so it is all really down to personal preference. If you have built-in bearings, this doesn’t apply to you. With traditional bearings, you need to use a speed ring and spacers to ensure maximum performance from your bearings. Not having these does not allow for your bearings to work as a solid unit. This means you can’t tighten down your axle nut without affecting your bearings performance. You will end up having your axle nut too tight or too loose. Too loose could allow for side to side play which will limit performance and the durability of your product. Too tight and you can add unnecessary friction to your bearings, slowing them down. Doing either of the above means your wheels won’t slide smooth and will chatter unnecessarily. This will affect your power slides, blunt slides, heel side slides etc. Basically limiting the performance of your wheels and overall setup. In summary, you should strive to have a setup that has all the necessary parts. Some people may argue that they aren’t necessary for skating, but they are simply necessary if you want to have gear that performs great. Thick grease like Lithium grease has a high viscosity and is really thick. It has a tendency to stick in the bearing and doesn’t run out very easily. Water, dust, gunk etc. don’t get into the bearing very easily because of this property. It also makes it really durable and you don’t have to do much maintenance to the bearing. Finally, the grease is also perfect for rain skating. Because it is sticky, it doesn’t let much water into the bearing. Comparatively, thinner grease will ensure less rolling resistance at slow speeds but will not protect your bearings as well from the elements. They will also need to be topped up more often than thicker grease and you’ll find yourself cleaning your bearing more frequently. Bearing lube shouldn’t really be a determining factor when buying a bearing, but you should take it into consideration when choosing what lube to maintain them with. That said, most fresh bearings need a few runs to ‘break them in’, so you can get the best performance out of them. I personally don’t care too much about the bearings I use. My last few sets have been cheap Chinese bearings that I bought on ebay. This works for me because I hate maintaining my bearings and it is much easier for me to simply replace them than maintain them. The bearings work fine and I honestly don’t notice much difference in performance in rolling. Though there is more to a quality bearing than how it rolls. However, Loaded recently sent me some Jehu bearings to review and I am loving them. They are built-in bearings are really convenient to use. I don’t feel much of a performance difference, but I am still in the process of testing them. If you want to go really quick on your skateboard. The wheel you choose will probably make more of a difference than anything else. Fast wheels like the Seismic Alphas are made from really dense urethane (Defcon urethane) and have a large core. In fact, the Seismic Defcon urethane is what Pete Connolly used to achieve the world record at L’Ultime Descent. These features allow for a wheel to accelerate fast and have a high top speed. Frankly speaking, picking a slow wheel will make you slower down the hill even if you have a really good tuck or ceramic bearings. In the long run, bearings don’t matter. If a manufacturer tries to sell you on their bearings through the Abec rating, it’s probably a scam and you should look elsewhere. A lot of products in the skate industry are snake oil and will be marketed based on hype and not actual performance. Unfortunately, we don’t have a regulatory board, so nobody is really verifying if companies are simply saying things, or can actually back up and stand behind their products. Beginner skaters are the most affected by this as they usually have the least experience and knowledge. Always research products and what features make them high quality. This will ensure always get high quality products and your moneys worth. Thanks for pointing out that having a slow wheel will not give good performance even if your bearing and tuck are good. I will share this information with my son since he will be buying a skateboard this weekend. It will be his first time since he has been interested in this due to a show he watched. This information will help him choose the best ones.